Hikvision has won a Chinese government tender which requires that facial recognition cameras be set up at the entrance of every single mosque (nearly 1,000 total) in a part of China under scrutiny for serious violations of religious freedom and human rights. Unlike the West, in China, religious groups are under the direct control of the Chinese government. Now, these mosques must allow facial recognition cameras to be set up and monitored by the Chinese government, enabling them to set alerts on people attending religious services as well as search when and how often people attend. How should governments be allowed to use facial recognition? What restrictions should technology providers (like Hikvision) put on use of their facial recognition? What are the ethics of such technology use? Hikvision won a 2017 government contract for a ~$46 million USD to build an extensive surveillance system in Xinjiang province's Moyu County. The project is called "Moyu County Social Defense System" (墨玉县社会面防控体系 PPP 项目). The project is one of $1.2 billion massive surveillance projects Hikvision and Dahua have both won since 2016 in Xinjiang. Media and activists have accused China of building a surveillance state in the historically Muslim province in a wildly disproportionate response to Islamist terrorism and separatist movements. The Moyu project drew particular scrutiny after wire news agency AFP reported that its original tender included six cameras for use in Xinjiang's "re-education" centers, places where China has allegedly detained hundreds of thousands of Uyghurs and other Muslim minorities. AFP also reported that security cameras would be placed at every one of Moyu's 967 mosques, and confirmed that Hikvision had won the tender. IPVM obtained this tender from the AFP and reviewed it. 967 facial recognition cameras to be placed at the entrance of each of the 967 mosques in Moyu County. Capability to process a “large batch” of facial samples. However, the tender makes no mention of required accuracy levels for facial recognition, which is a significant concern given the immaturity of the technology and the problems if mistakes are made. The project includes even more provisions for video-based surveillance and censorship systems specific to mosques, such as a video conferencing system for “unified” sermons to be broadcast in mosques from a “video conferencing hub” in Moyu County’s Ethnic Affairs Commission. Such a system would effectively eliminate the need for any preachers to hold their own sermons. 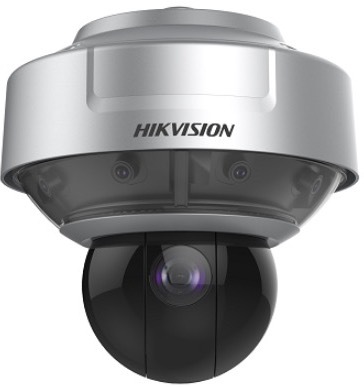 The project Hikvision won adds 840 security cameras for the mosques (in addition to the facial recognition cameras). These are a combination of bullet and dome cameras as well as night-time full color dome cameras. The tender estimates that each of Moyu County’s 967 mosques already has 5 security cameras, or a total of about 4,835 cameras. These existing cameras are to be integrated into the new surveillance system, i.e. the 967 facial recognition cameras + the 840 dome/bullet cameras. While the tender does not list the specific Hikvision model used, the closest match to that is the PanoVu Series 360°, shown to the right. There are many re-education camps, however, and we have not found documentation yet showing the suppliers of those other camps. While Xinjiang mosques have long been closely monitored by the government – including through the use of traditional security cameras – one expert on the region told IPVM the use of facial recognition represented a “significant escalation in the Party-state’s surveillance efforts” which would have a “chilling effect” on religious freedom in China. The use of face recognition technology in Xinjiang mosques is about controlling the terms of access. The technology allows authorities to quickly identify blacklisted individuals and youth under the age of 18 and prevent them from accessing the mosque. It also allows them to keep more systematic data on who is attending, how often, and quickly identify any individuals who have been flagged due to ‘extremist’, anti-state or anti-party attitudes/behavior, and deny them access. Another Xinjiang expert, China studies professor Timothy Grose at the Rose Hulman Institute of Technology, said he had heard of other cities like the capital of Urumqi also equipping mosque entrances with facial recognition cameras. Grose said he had witnessed young boys attend Friday prayers in 2015, despite the official ban, potentially putting such youths at risk for breaking the law. Hikvision formally declined to comment to IPVM for this story. The use of forced facial recognition in these mosques poses significant questions about the technology's broader ethics. Indeed, in the European Union, the GDPR's Article 9 bans biometric processing techniques like facial recognition. It does include a "public interest" exception for authorities; however, the processing must "respect the essence of the right to data protection and provide for suitable and specific measures to safeguard the fundamental rights and the interests of the data subject". Interest in regulation in the United States is increasing as well, even from technology companies. Just last week, Microsoft advocated public regulation of facial recognition and Amazon has come under scrutiny for public facial recognition pilots. Of course, there is little chance of limits being placed on facial recognition within China's one-party authoritarian state. But should companies, like Hikvision that claim to be independent commercial entities be selling and deploying their facial recognition for such practices?